Terri Boettcher, a chronic pain patient, in her Middletown home discusses her struggles with back and other pain and treatment. Staff photo by Bill Green. Originally published on The Frederick News-Post. For almost half a year, Susan Haller has watched her husband — a chronic pain patient — slowly erode. Until the summer of 2017, Haller said, her husband’s pain was managed through a combination of extended-release Opana — a prescription opioid painkiller — and generic oxymorphone, another opioid. The medicines helped him manage a diagnosis of fibromyalgia and searing pain in his side that started four years after a kidney surgery in 1997. The medication, taken under the supervision of a pain management specialist, allowed him to retain a relatively normal quality of life. But in July, the Frederick couple’s previous insurance company went bankrupt, and Haller switched to CareFirst BlueCross BlueShield, which announced it would no longer pay for Opana after the U.S. Food and Drug Administration ordered its manufacturer to remove the drug from the market. Haller said that her husband was then switched to methadone, one of the only opioids that CareFirst would cover. But the insurance company also dramatically reduced the dosage of his medication. He went from taking 40 milligrams of Opana and 10 milligrams of oxymorphone five times a day to 10 milligrams of methadone and 10 milligrams of oxymorphone five times a day — a more than 50 percent decrease in medication. Since then, CareFirst has gone even further to restrict her husband’s access to opioid painkillers. On Jan. 19, Haller learned that the company would limit him to 60 methadone pills and 90 oxymorphone pills — at 10 milligrams a pill — over a 25-day period. If her husband’s doctor agreed to prescribe more than that amount, the couple would need to pay the difference out of pocket, something Haller estimated would cost around $1,000 a month. Her husband, already reeling from the earlier reductions, now faces the prospect of taking more than four times less medication than his doctor originally recommended. And Haller, a part-time professional caregiver, has worries of her own. In an effort to dull his pain, she said, her husband has started to self-medicate with alcohol when he’s alone at the house. He’s also gone from working 60 hours a week to 25 or fewer, a shortfall that her own salary won’t cover. Amid the panic surrounding the opioid crisis in America, Haller and her husband are part of what they feel is an underrepresented community — chronic pain patients whose treatment is increasingly affected by new regulations on prescription painkillers. Leading the charge are insurance companies, pharmacies and the Centers for Disease Control and Prevention, which in 2016 issued new guidelines for prescribing opioids for chronic pain. The recommendations were issued, according to the agency, “as part of the urgent response to the epidemic of overdose deaths,” and urge primary care providers not to consider opioids as a “first-line or routine therapy” for chronic pain. The effects of the new guidelines were far-reaching. In September 2017, CVS Pharmacy made headlines by restricting new opioid prescriptions to a seven-day supply. Other pharmacies, including Rite Aid, soon followed suit. A seven-day supply for new prescriptions, as well as limits on daily dosage, are now the industry standard for many major pharmacies and private health insurance companies. CVS, Rite Aid, Aetna and CareFirst all limit new or acute pain patients to a seven-day prescription. 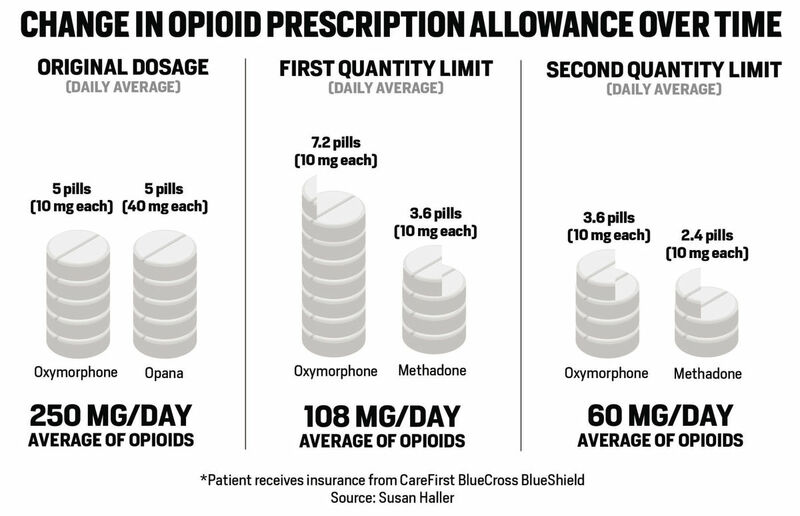 They also require patients to receive approval from their insurance company before filling prescriptions that are more than 90 morphine milligram equivalents a day — the same as 60 milligrams of oxycodone, or around 20 milligrams of methadone. Even the state of Maryland attempted to regulate opioid prescriptions during the 2017 legislative session. The first version of a proposed prescriber limits bill would have prevented doctors from prescribing more than seven days’ worth of medication except in cases of terminal illness. Corporations largely frame the new policies as a matter of safety, shaped by CDC recommendations and a growing understanding of opioid abuse. CareFirst cited the more than 1,000 people a day treated in emergency rooms across the U.S. for prescription opioid misuse. Aetna highlighted CDC data on the skyrocketing number of opioid overdose deaths. All four companies pointed out the need to prevent medication abuse among customers. But for many Frederick County pain patients, the new guidelines do exactly that. Tamara Walker, another chronic pain patient in Frederick, said she spent a full day traveling to different pharmacies when her regular drug store in Walkersville was unable to fill her monthly prescription for Percocet. Her prescription is electronic — which many pharmacies and insurers now require for easier opioid monitoring — and can’t be transferred to other stores or branches. So, Walker, who doesn’t use a car, took public transit all the way to her doctor’s office in Westminster to pick up a written copy of the prescription. Later that day, many pharmacies refused to tell her over the phone whether they had the medication in stock. A pharmacist at a local Wal-Mart said that doing so would be against the company’s policy. Walker said she heard the same thing from a nearby Rite Aid. A Giant pharmacy in Westminster later refused to fill the prescription because she wasn’t a regular customer. All in all, Walker said, she visited more than half a dozen different pharmacies in an effort to fill her prescription. Walker also struggled at the beginning of the year when her insurance company told her it would require prior authorization before covering a new prescription. She applied for the approval, but the company also refused to cover a seven-day emergency supply while she waited. Luckily, Walker said, she was able to pay for the drugs out of pocket. But her recent experiences have made her fearful that restrictions on opioid painkillers will continue to grow tighter. She relies on the medication after a traumatic car crash in 2015, which stripped the skin from her lower left leg and fractured her back in five places. Even with the help of pharmaceuticals, Walker said, there’s never a moment of the day when she isn’t in pain. Without the drugs, her experience is unbearable. A lack of empathy on the part of federal health officials is driving a growing fear within the chronic pain community, added Terri Boettcher, a patient from Middletown. Many feel stigmatized by a relentless focus on opioids in the media and among legislators. A former ambassador for the U.S. Pain Foundation, Boettcher also said that broad restrictions are impeding patients’ ability to receive customized care. After a gardening accident in 2000, she tried a spectrum of medications — from Ibuprofen to Lyrica, a nerve pain medication — to manage the pain from a herniated disc. She went through a failed back surgery, steroid injections and several rounds of integrative treatment, including physical therapy and acupuncture, before she and her doctor settled on a daily dose of oxycodone for pain management. When access to those opioids is restricted, Boettcher said, it has a crippling effect on patients whose symptoms aren’t relieved by alternative treatments. Her own prescription has already been cut down from a 60-day supply to a 20-day supply, and her own health has suffered as a result. Recent restrictions on opioid medications have also affected physicians. Many primary care doctors have grown increasingly leery of prescribing the medications, pushing more patients into the hands of specialists. 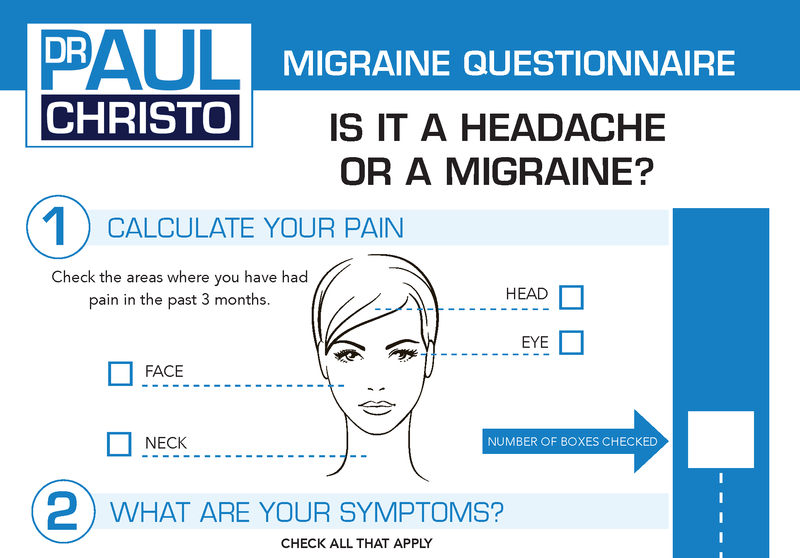 Dr. Paul Christo, a pain specialist and associate professor at the Johns Hopkins University School of Medicine, has noticed the same trend at his practice in Baltimore. The host of “Aches and Gain,” a Sirius XM talk show on pain management, Christo has educated hundreds of patients and listeners on the benefits and drawbacks of prescription opioids. And while he’s made a career in pain management, he also worried that a widespread focus on opioid abuse could spread false perceptions about the propensity of pain patients to abuse their medications. The problem, Christo said, is that long-term pain management patients are not among those who are likely to abuse narcotic painkillers. Most have extremely high levels of discomfort and are too worried about being cut off from their medication to abuse or divert it. The vast majority of pain management centers also subject their patients to various control methods, including urinalysis and scrutiny through the state’s prescription drug monitoring program. Pain at the End: Are Opioids a Risk or a Relief? Posted in Addiction, Blog, In the News, Print.